This 8 in 1 heat press machine with two digital LCD timer & temperature control. This swing-away heat press boasts all of the must-have attachments. It can transfer colorful pictures and characters of sublimating and dissolved printing ink onto ceramics, glasses and textiles such as cotton, flax, chemical fiber, nylon, etc. 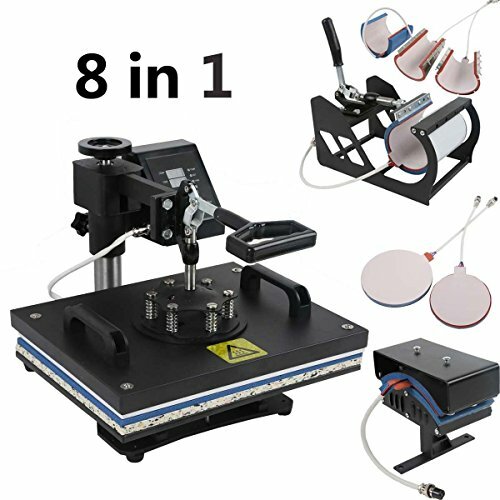 This eight-in-one heat press can be used for T-shirts, caps, ceramic plates, ceramic tiles, mugs, coasters, mouse pads, jigsaw puzzles, lettering, other misc. fabrics & materials.